Filled with fantasic, moody lighting, ambigious characters, and a murder plot to ( literally) die for, this movie is sometimes cited as one of the best examples of film noir ever made- Double Indemnity. The film's name comes from the insurance term for the unlikely instances when double the normal amount of money would be paid off on a life insurance policy. Seeing one of the century's most electric journalistic photos- a woman, Ruth Snyder, in the electric chair for his part in a murder and attempt at insurance fraud- sparked the idea for James M. Cain's novella Double Indemnity. Though this book would eventually be translated onto film by director Billy Wilder, it was a long road getting there. It began circulating through the different Hollywood studios in 1935, the Hays Office (the powerful group that enforced film codes) described the script as sordid, and claimed it would corrupt audiences. As indeed it sordid it was. Even after 8 years, when the Hays Office finally gave the script a go, casting became an issue; no one wanted to play such seedy, unredeemable characters. Barbara Stanwick,who plays the ultimate femme fatale in the film, later recounted, "I said, "I love the script and I love you, but I am a little afraid after all these years of playing heroines to go into an out-and-out killer." And Mr. Wilder – and rightly so – looked at me and he said, "Well, are you a mouse or an actress?" And I said, "Well, I hope I'm an actress." He said, "Then do the part". And I did and I'm very grateful to him." Likewise, getting a male for the lead was a hard sell. The part was turned down by several actors, including George Raft (who was so illiterate he had to have the script merely described to him. He turned it down on finding out the male lead was not secretly a good guy FBI agent. 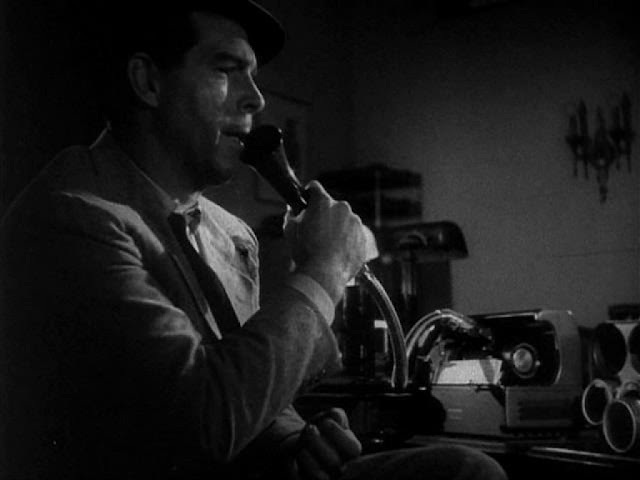 ), but the part eventually went to Fred MacMurray. Known at the time primarily for playing happy-go-lucky comedy, he had been nervous about a serious role. Both actors shine though in a script that was so well tweaked for stage the novel's author said he wished he thought of some of the dialogue. Walter Nuff, played by Red MacMurray, is an insurance sales man who is instantly taken when he sees housewife Phyllis, played by Barabra Stanwyck, in nothing but a towel and anklet (Adjusting the thickness of the towel is what got the film past the Hays Office!) Call it love; call it obsession whatever it is that draws these two together also draws out a daring. As Walter puts in his classically "hard-boiled" voice over, knowing the insurance bussiness so well is sort of like being a card dealer at a casino. You spend everyday making sure no one plays the house; you know every trick there is. You could play the house and no one would ever know, and that is what this pair attempts to do- the play out he perfect murder and wait around to collect on the insurance money. They play it straight down the line, but human nature gets the better of them in this suspenseful and brillant fim noir. I was on the edge of from the moment the movie starts with Walter taping his confession and leaking blood. The characters, though rather nasty peices of works, are compelling in their emotional dependency. You watch for the moments of failure and moments of success in their plan. However, the best part of the movie is not the acting nor the script. It is the lighting- Beautiful, moody and wonderful just to stare at. It underscores the claustrophobic, hysteric atmosphere that builds. This film's straight down the line. If you're thinking of a life insurance policy, you'll be thinking twice when you watch Double Indemnity. Oh I'm so glad you watched it! I need to watch it again after reading your review!